We see ZORA as a proven first mover and the one to actually gain acceptance in senior health care use cases. ChartaCares, the technology enabled health care business unit of ChartaCloud Technologies (“ChartaCloud”), today announce that it will offer ZORA, the humanoid robot for assisted health care to U.S. skilled nursing facilities and retirement communities. 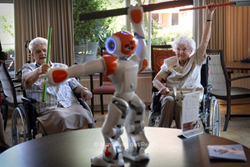 Developed by ZORA ROBOTICS of Ostend, Belgium, the ZORA application for the Aldebaran NAO robot has been widely adopted in European communities with over 200 ZORA robots already assisting health care workers and enhancing the quality of life of seniors. “We have all been waiting and watching as to when and how humanoid robots would enter the health care market as a real and practical product. We see ZORA as a proven first mover and the one to actually gain acceptance in senior health care use cases. Following our own extensive testing we are convinced that ZORA will be a revolutionary step forward in the practical deployment of humanoid robots in health care. The combination of ZORA’s software for senior care use cases used with the NAO robot from Aldebaran, which is the world’s most popular humanoid robot, we believe creates a formidable new era in senior care.” said Lauryn Schimmel, managing director, ChartaCloud. The ZORA application provides a robust suite of ready to go behaviors for use in senior care such as leading exercise classes, leading dance sessions, providing therapies for cognitive impairment, playing group and individual games, providing seniors with general information such as today’s news and weather and the day’s events and food menus. “The ZORA experience with seniors and care givers has been most rewarding and their testimonial support proves the enthusiasm for ZORA. ZORA quickly becomes a vital extension of the care staff and delivers a significant enhancement to the daily quality of life for seniors,” said Tommy Deblieck, co-ceo, ZORA ROBOTICS. “ChartaCares makes an excellent U.S. partner for us as they are deeply experienced in technology enabled health care and especially in robotics,” Deblieck added. The company stated that the adoption of ZORA cannot only be justified by the quality of life enhancement it provides seniors but as a staff augmentation resource that helps relieve the burdens on care giving staff. For example, ZORA can lead an exercise class while staff can be more involved in working one on one with seniors versus having to stop the exercises to help or correct. ZORA can easily be used in one on one sessions that stimulate seniors via games, music and therapies that are vital to the lessening of the frustrations of Alzheimer’s /dementia. Controlled via a tablet computer, care staff can easily re-purpose ZORA for the selected situational use case. Custom use cases are easily created via ZORA’s user friendly software. Zora Robotics is a joint venture between Belgian IT engineers committed to developing future technologies and like-minded Dutch entrepreneurs. Zora Robotics was established with a vision to look ahead and understand the trends and forces which will shape our world and to move swiftly to prepare for the future through innovative solutions and services that make peoples’ lives better, easier and happier through increased functionality and service. Zora Robotics designed the Zora robot’s unique software. Specializing in process automation designed to deliver organizational efficiency, operational effectiveness, competiveness, responsiveness and profitability, ChartaCloud offers full-service solutions to help businesses overcome the challenges of paper, people, and workflow in the age of digitally driven mobility. These solutions enable large or small businesses to seamlessly connect existing paper documents with digital technologies to drive workflows and task management and maximize profits and sustainability.